A budget $4.98 list-priced collection of ethereal, gothic, dark cabaret, neo-folk and darkAmbient artists. 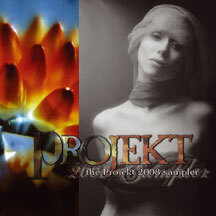 The latest in Projekt’s successful series of budget samplers features 2008 releases, including six unreleased tracks. Exclusive to this release is “Rock of Ages (radio edit),” an edit of a track from the new Attrition album, with new vocalist Sin D’rella.